This article is about the recurring duo in the Super Smash Bros. series. For the microgame from WarioWare, Inc.: Minigame Mania, see Ice Climber (WarioWare, Inc.: Mega Microgame$!). For the microgame from WarioWare: Twisted!, see Ice Climber (WarioWare: Twisted!). For the WarioWare: D.I.Y. microgame, see Ice Climbers (WarioWare: D.I.Y.). "Popo" redirects here. For information about the enemy in Super Mario Sunshine, see Poink. 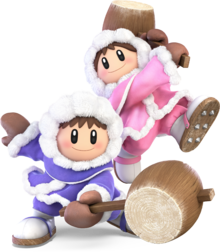 The Ice Climbers, named Ice Climber in Japan, are a pair consisting of a little boy named Popo and a little girl named Nana, who originate from the NES game Ice Climber. Though they have only had one single game of their own, aside from VS. Ice Climber, they have made frequent crossover appearances in other Nintendo games, including Game & Watch Gallery 4, WarioWare: Twisted!, WarioWare: Touched!, Tetris DS, a mention in Game & Watch Gallery 3, and another appearance in NES Remix. Both Ice Climbers are playable fighters in Super Smash Bros. Melee, Super Smash Bros. Brawl, and Super Smash Bros. Ultimate. The Ice Climbers are flown to the stage by the condor. 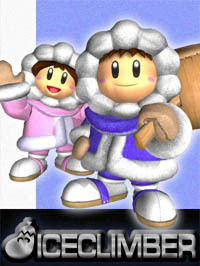 The Ice Climbers appear as a new, playable default character in Super Smash Bros. Melee. The two are unique, as they fight as a team, but act as two separate characters. Depending on the alternate costume, the player can control either Popo or Nana, while the other is a computer player that copies their inputs and returns to the player when they are separated. The Ice Climbers attack simultaneously, and as they are two characters the player can grab two opponents and hold two items at once. If the second climber is KO'd, the leading one can still fight, but their attacks are not as powerful as they would be if both are present. However, if the player-controlled climber is KO'd, they are both sent back to the respawn platform. Also unique to the Ice Climbers is that they have normal traction on slippery ground. Their neutral special move is Ice Shot, which sends out icicles toward the opponents. Their side special is Squall Hammer, in which the climbers spin around with their hammers. Their down special move is Blizzard, which has Popo and Nana send out a blast of cold air. Their up special move is Belay, in which one of the climbers throws the others into the air with a rope to pull the other up. Both Popo and Nana are voiced by Sanae Kobayashi. The Ice Climbers return to the series in Super Smash Bros. Brawl, retaining their moveset and attributes from Super Smash Bros. Melee. 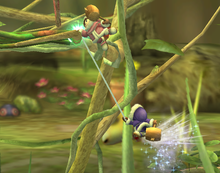 However, both Ice Climbers are able to grab a ledge at the same time; in the previous game, the other climber cannot grab on if one is already on the ledge. 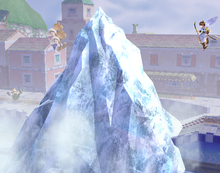 Their Final Smash is Iceberg, in which they create a large iceberg in the middle of the stage. The Ice Climbers were first seen climbing up the Glacial Peak, completely oblivious to the shootout between the Great Fox and the Battleship Halberd. However, they do see Meta Knight climbing past them, trying to get to the Halberd. The Ice Climbers see this as a challenge, and race him to the top, managing to reach it first. However, they discover the Aura Pokémon Lucario up there, who challenges Meta Knight. Popo and Nana could only watch. Just after the battle, the Halberd rams the Great Fox into the mountain. While Meta Knight and Lucario take this chance to get inside the Halberd, the Ice Climbers fall into the Canyon, where they find themselves with Marth, Lucas, the Pokémon Trainer, and Ike. The Subspace Army attacks them all, but they are saved by Mario, Link, Yoshi, Kirby, and Pit. The Ice Climbers eventually go to Subspace with all of the heroes, where they all get turned into trophies by Tabuu. Fortunately, Kirby is then revived by a badge created by King Dedede, so he saves Popo and Nana along with some other characters. The entire team then goes after Tabuu. The Ice Climbers do not return as playable characters in Super Smash Bros. for Nintendo 3DS and Super Smash Bros. for Wii U, making them the only playable characters in the entire series that have been playable in more than one game to be cut. The director of the games, Masahiro Sakurai, has stated this is because they were unable to run smoothly on the 3DS version of the game, and that while the Ice Climbers were running perfectly in the Wii U version, they were not kept in since he wanted both versions to share a consistent roster. Instead, they appear as a trophy in both versions of the game; the trophy is a random unlockable in Super Smash Bros. for Nintendo 3DS; to unlock the trophy in Super Smash Bros. for Wii U, the player has to KO his/her rival four times in a single Rival Smash match. 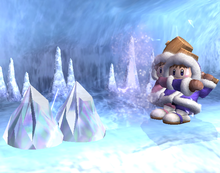 Icicle Mountain's theme from Super Smash Bros. Melee and Ice Climbers' theme from Super Smash Bros. Brawl returns in the Wii U version as alternate themes for the Wrecking Crew stage, despite the characters removed. On a side note, the Polar Bears from their series appear as enemies in the 3DS-exclusive game mode, Smash Run. The Ice Climbers, alongside all Super Smash Bros. series veterans, return as unlockable playable fighters in Super Smash Bros. Ultimate. They received many aesthetic changes, such as Nana being more expressive when Popo grabs an opponent, or vice-versa. The Ice Climbers also have 8 costumes, like all other characters in the game. The Ice Climbers retain their Final Smash from Super Smash Bros. Brawl, though it functions slightly differently. Mario, Peach Princess Peach's Castle Main Theme - New Super Mario Bros.
Ice Shot is the Ice Climbers' standard special move. 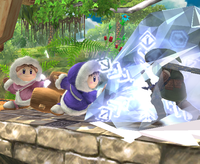 Two small chunks of ice appear, and the Ice Climbers hit it along the ground, hurting anyone it happens to hit. It deals approximately 5-8% damage. In the case of Popo/Nana being the only Ice Climber active, only one small chunk of ice appears. In Super Smash Bros. Ultimate, the Ice Climbers take damage from their own Ice Shots if reflected back at them. Squall Hammer is the Ice Climbers' side special move. Popo and Nana spin forward with their mallets held out in the direction the Control Stick is tilted. It deals approximately 7-19% damage. The attack is less effective if only one Ice Climber is in battle. In Super Smash Bros. Melee, Popo and Nana use only their left hands to swing the mallets, as opposed to Super Smash Bros. Brawl, where they use both of their hands to swing their mallets. Belay is the Ice Climbers' up special move. Popo/Nana throws their partner up into the air, allowing them to use a belay to pull themselves upwards. It is also able to damage anyone who gets in the way of the attack. The attack is far less effective if only Popo/Nana is in the battle, where the solo Ice Climber performs only a little hop, and has no effect when used on the ground. Both Ice Climbers are put into a helpless state once the move finishes. Blizzard is the Ice Climbers' down special move. 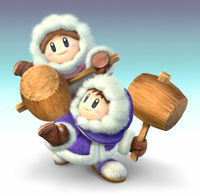 When used, a small blizzard comes out of both of the Ice Climbers' hands; if two Ice Climbers are present, the player Ice Climber faces forward while the CPU partner faces back, making the Blizzard cover both sides. 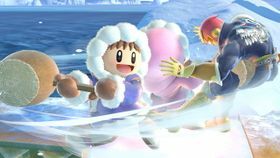 If used in the air, Popo and Nana both fire the blizzard in the same direction as the player Ice Climber. It usually deals around 5-13% damage. However, if the Ice Climber partner has been defeated, Popo/Nana can shoot only one blizzard. The attack can briefly freeze an opponent if the opponent has high enough damage. Iceberg is the Ice Climbers' Final Smash. 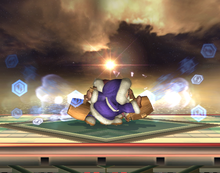 Once the Ice Climbers break the Smash Ball and the move is activated, the two high-five each other and a giant iceberg appears from below, taking up a large amount of space on stages. This not only freezes any platform in the surrounding area, but also damages any opposing player who touches the iceberg, doing a heavy amount of damage and sometimes freezing them. The attack can also be done with only one Ice Climber, and if done by one Ice Climber, the solo Ice Climber raises their hammer to call the iceberg. Players can attack the iceberg to shrink it, though the iceberg shrinks completely after a period of time. In Super Smash Bros. Ultimate, the Final Smash is slightly different. The iceberg now revolves, and no longer freezes opponents, instead only damaging them. The condor flies overhead, which the Ice Climbers can grab as it flies back and forth above the stage. The Polar Bear from Ice Climber can also be seen teetering on the side of the iceberg. The Ice Climbers appear as one of the add-on Mystery Mushroom costumes that are unlocked after completing an Event Course titled "Popo & Nana's Climbing Challenge" in Super Mario Maker. Their animations and sound effects are taken directly from their original game. 10/85 That's Popo in the blue and Nana in the pink. These two stars of the game Ice Climber have scaled many an icy summit in their mountaineering careers. Back in their glory days, they chased eggplants, cucumbers, and other vegetables that inexplicably fell from frosty summits when a condor reigned supreme. They're rarely seen apart. Smash B: Squall Hammer This unique twosome fights together as a team. Your score will not be affected if the CPU-controlled character is KO's, but a lone Ice Climber won't be able to use teamwork moves, which will make for a tough and frantic solo fight. The Ice Shot fires mini-glaciers out of their hammers, while Squall Hammer is at its strongest when Nana and Popo combine their strength. Down & B: Blizzard The colors of the Ice Climbers' parkas denotes who's in the lead: Nana's in pink or orange, while Popo's in green or blue. Their hairstyles are also slightly different. Belay allows them to cover great distances, but doesn't give foes the chance to target their landing. Blizzard is best used in close quarters; in the fray, Nana and Popo will sometimes freeze opponents. Snake: So those two are the Ice Climbers, huh? Mei Ling: Snake, have you ever heard of a "blood bond"? Mei Ling: It refers to a bond between two people that's so strong they'd die for each other. The Ice Climbers have conquered frozen glaciers and dangerous mountaintops together. I think they've formed a bond that we can't even fathom. Snake: I dunno. Seems to me they'd get in each other's way fighting to see who gets to the top first. Mei Ling: Snake, in China they say, "Though brothers may quarrel at home, outside they defend each other from slight." Snake: Is that really a Chinese proverb? Mei Ling: Even though they may get in each other's way occasionally, they'll pull together in times of need. They're an inseparable team, Snake. Don't underestimate them! NES Ice Climber The one in blue is Popo, and the one in pink is Nana. They use their incredible jumping powers and hammers to break blocks and climb to the summit. They grab veggies, and if they can catch the condor at the end, they conquer the mountain. Other than breaking blocks, their hammers are good for sending foes flying, climbing down from blocks, and destroying icicles. Wii Super Smash Bros. Brawl The Ice Climbers' Final Smash. This giant ice mountain appears in the middle of a stage--it's incredibly slippery, so it's hard to control yourself when traversing it. In addition to being slick, this ice is also COLD, so opponents will take damage just from touching it. Attack the ice, and it will take damage and slowly shrink. Is it actually useful? That's a mystery. NES Ice Climber (10/1985) This pair of adventurers starred in an action game released in 1985. Popo wears blue, and Nana wears red. The goal of their adventure was to reach the top of the mountain, collecting vegetables and defeating animals along the way. Grabbing the condor earned them a nice bonus too! Popo (in blue) and Nana (in pink) are the daring adventurers from the two-player platformer Ice Climber, released in Europe in 1986. In that game, your goal is to head up a mountain, breaking blocks and taking out pesky critters along the way. When you get to the top, you can collect veg and grab on to the condor to get bonus points! Nice! Pit: Two of them? That's cheating! Palutena: Say hello to the Ice Climbers. They haven't always had the best cooperation, but their teamwork seems pretty solid now. Pit: OK, sure, but...What about the fact that there are two of them?! Didn't they get kicked out of Smash for illegal teaming? Palutena: Well they're back now, so I'm pretty sure it's allowed. I mean, you could pair up with Dark Pit if you wanted to. Palutena: Your physical powers are equally matched. It's a perfect fit, really. Palutena: Now then, which one of you is the leader? Dark Pit: No way. I'm the leader. Viridi: Oh yeah. They make a perfect team. Palutena: In any case, when fighting the Ice Climbers, defeat Nana first to isolate Popo. Try to separate them! In the German version, Popo was renamed to "Pepe" due to "Popo" meaning "buttocks" in German. The Ice Climbers' Chinese name literally translates to "Snowman Brothers," despite the fact that Nana is female. This page was last edited on March 25, 2019, at 21:50.